Azaleas are blooming all over the place in the D.C. area, and they are extra-beautiful this year. I was afraid rain and possible tornadoes(!) would decimate them last night, but nothing materialized–yay. The focus is a bit off on this one because I was dealing with some pretty strong wind. Is anyone watching the royal wedding tomorrow? Unless I wake up at 4 a.m., I’ll probably miss it. I’m sure they’ll have plenty of re-broadcasts. Even the Weather Channel is covering it! Lastly, thanks so much for the lovely comments yesterday. I couldn’t answer them individually because I had to shut off my computer last night due to the weather. I really appreciate the feedback. 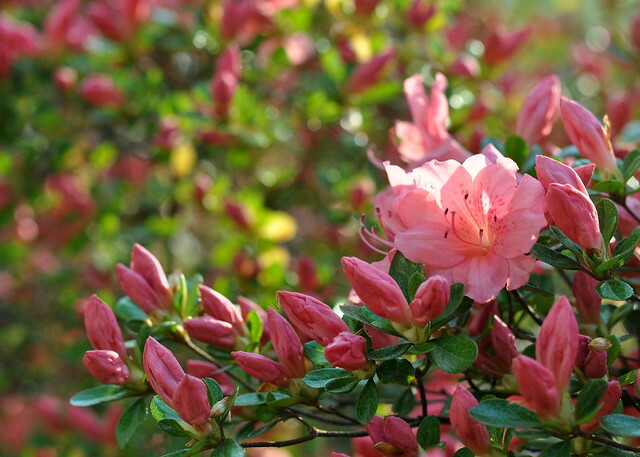 This entry was posted in photography and tagged flower buds, natural light, pink azalea blossoms. Bookmark the permalink. Very beautiful colors, the second is my favorite. I really enjoy macro shots of flowers! Thanks. I see that you like photographing flowers too. I’m so glad spring is finally here. I miss azaleas! They were all over the place when we lived near Philadelphia, but I never see them here in L.A. Thanks for the pictures! You’re so welcome. I missed them too when I lived in California. 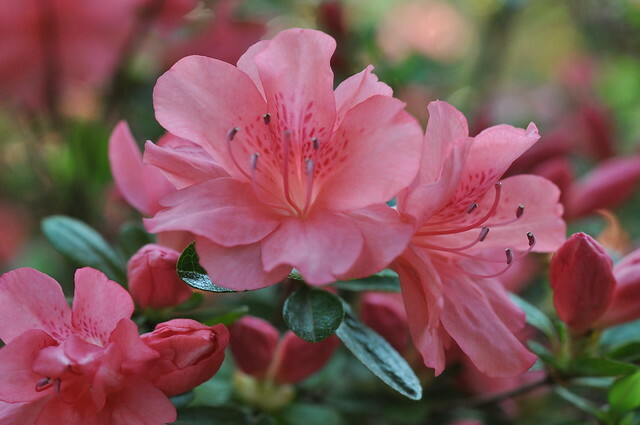 Our azaleas were terrific this year as well – you guys are running about a month behind us – our official Azalea Trail in Tyler was right on time this year – late March – early April. Last year it came and went with virtually no blossoms due to prolonged cold wet weather – and we actually had snow flurries on April 1 ! Was just wondering about you, Susan! Isn’t this weather bizarre? We’re having tornado warnings again today–very strange. Azaleas are so beautiful. We have Rhododendron and Oleander here. That must have been quite a strom if you had to turn off the computer. We can hardly imagine this here. For some reason, our street loses power during any kind of storm. So annoying to have that happen when you’re in the middle of something on the computer. It didn’t go out last night, but we did have tornado warnings. Very unusual for this area. Ahh…I love the second one! Beautiful!! Such gorgeouso blossoms … only in pots and green houses up here. Wonderful to think of them growing, proliferating in the gardens around DC. Cheryl, I had never even seen azaleas in pots before I moved to the East Coast. It was way too cold in the Midwest too. Very beautiful Azaleas. Their color differs from those we have. So beautiful. It just so happens that I was in Azalea heaven the day before the Royal wedding. I was on a work trip to London and I was brought for a walk to the Isabella Plantation in the middle of Richmond Park. I think I died and went to heaven. I was hit with the sweet scent of Azaleas and Rhododendrons. That is all that grows here, it is such a wonder. If ever you get a chance to come across the big pond, you have to go here. Thank you for letting me know. 🙂 This place looks fantastic.